Growing edible forest gardens on public lands to nourish, educate, and inspire. Historic moments and positive momentum! Mark your calendars! Food Forest FUN-Raiser, Dec. 1st! Come to Festival Beach for the Fall It’s My Park Day! 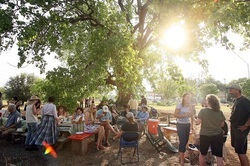 Festival Beach Food Forest is located at 25 1/2 Waller Street. Street parking is available, and a curb cut/ramp is available at the northwest edge of the property. an Urban PatchWork and East Feast project.